The Korg Minilogue Polyphonic Synthesizer re-invents the analogue synthesizer for the digital age. This stunning creation station boasts all-analogue circuitry, dedicated controllers for masses of sound design and connectivity to integrate it into any modern or vintage workflow. The Minilogue employs all-analogue circuitry so that you get the pure and powerful sound that only analogue is capable of. Added to this is the capability to produce up to 4 voices of polyphony using a 2VCO, 1VCF, 2EG, 1VCA, and 1LFO structure. You can fine tune all oscillators’ harmonics, creating the most divine soundscapes. The top panel of the Korg Minilogue presents you with 41 real-time dedicated controllers for getting your hands dirty. There are no hidden agenda's, locked off menus or awkward combinations here, just pure, presentable analog control to give you the best performance on stage or in the studio. The addition of a 37 slim-key velocity sensitive keyboard lets you play with incredible expression. Korg Minilogue Polyphonic Synthesizer can talk many languages so that it can work in a symbiotic relationship with your existing creative equipment. 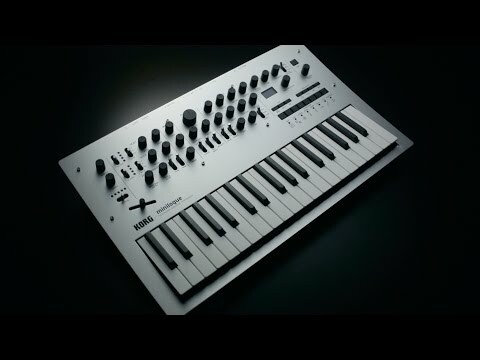 MIDI and USB connectivity allow the power of the Minilogue to be used with computers and modern era synths, whilst the 3.5" jack sync in/out means it can be used alongside any other csv capable synths, modern or vintage. The Korg Minilogue Polyphonic Synthesizer is a powerful instrument that's bursting with analog power packed into an elegant, sleek and well built unit that is both practical and beautiful for studio or stage. Dimensions(WxDxH) 500 x 300 x 85 mm / 19.69" x 11.81" x 3.35"